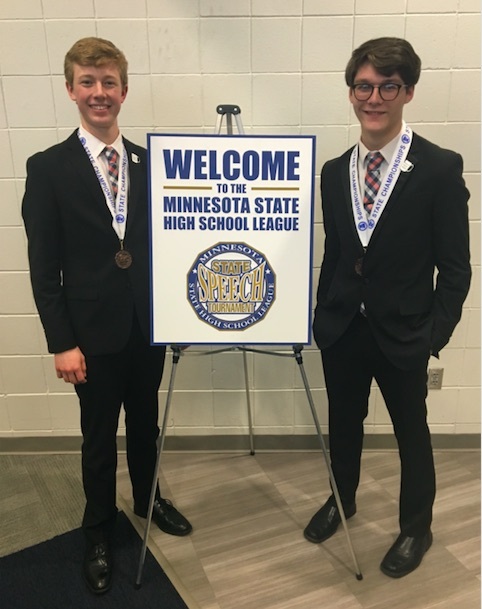 Congratulations to Kole Gieseke and Kaelan Emerson for qualifying for Nationals with their speech duo. Kole and Kaelan earned a third place medal at the State Speech Meet in April. We have started our new organics/composting program in our cafetorium. PTA Buy-One-Get-One-Free Book Fair is coming…. The book fair will take place next week in the media center conference rooms. Last PTA meeting of this school year will be Monday, April 8th at 6:30 pm in the Elem Teachers Lounge. Important Business: -Still in need of a Secretary and President. We can't be a PTA unless we have these two positions filled. Events in need a coordinator: -Fundraiser (No fundraiser-no money) -Label Collection -Book Fairs -Bingo These will not be held next year if we have no one to do them. Jr. Duck Stamp State Champion! Congratulations Julia! We had 8 students receive a Superior Ratings, 5 students receive 6 Excellence Ratings, and Madison Carey won the section art show in the category of Photography. Her winning photo titled “Crushed” will be sent to Minneapolis in May to represent our school in a statewide MSHSL Visual section festival. View your child's class schedule, grades an other information here. Make payments for your students' lunch fees here. View our classroom activities and events through our Panther Photo Den. Order your High School yearbook here!! Order your Middle School yearbook here!! The Park Rapids Area Schools have a history of vision, excellence and success that is summed up in our mission: "Preparing today's learners for tomorrow's challenges." It is our goal to meet each child's individual needs, whether that child is a preschooler, a high school senior, or any age in between! If your family is considering a move to our area you probably have many questions. Use the links at the top to help guide you to your answer. Below are the initial forms that need to be filled out for student enrollment. These forms will need to be turned in to the specific building in which you are enrolling your child. Each building will also have additional forms that will need to be filled out. You will also need to provide a copy of a birth certificate for each child being enrolled. If you live outside of the Park Rapids school district please fill out the Statewide Enrollment Options form. We are happy to welcome your student to Park Rapids Area Schools! View the activities taking place today for the teams of Park Rapids Area Schools. Go Panthers! Check out individual sports schedules here. ISD 309 does not discriminate on the basis of race, color, national origin, religion, gender, or disability.